Where is your key fob? So far I have been keeping my C7 key fob in my pocket when I drive my Z51. There is a slot in the steering column for the fob and plenty of room in the console or behind the nav screen etc. My question is ‘is there a best place to keep the fob’ and why? Mine just stays in my pocket. I don't see any good reason to pull it out of my pocket in order to drive, so I don't use the slot for anything on a daily basis, and doing so seems like it would increase the odds that I'd forget that it's not in my pocket and walk away with the fob still in the car. Always in my pocket, then there is no chance of leaving it inside the car by accident and I don't even have to think about where the fob is, I just get in and out of my car without any worries. Pocket, except on long trips, in which case it (and my wallet) go into the Hidden Compartment. Now everyone knows my secrets. I carry mine to the car then drop it in the side pocket of the door, same with the house keys. If key is forgotten mine sounds the horn 3X's but it's just routine for me now. In my pants pocket. I have an alligator clip that attaches to the inside of my pants pocket that hangs from the key fob so it accidentally doesn't fall out of my pocket. 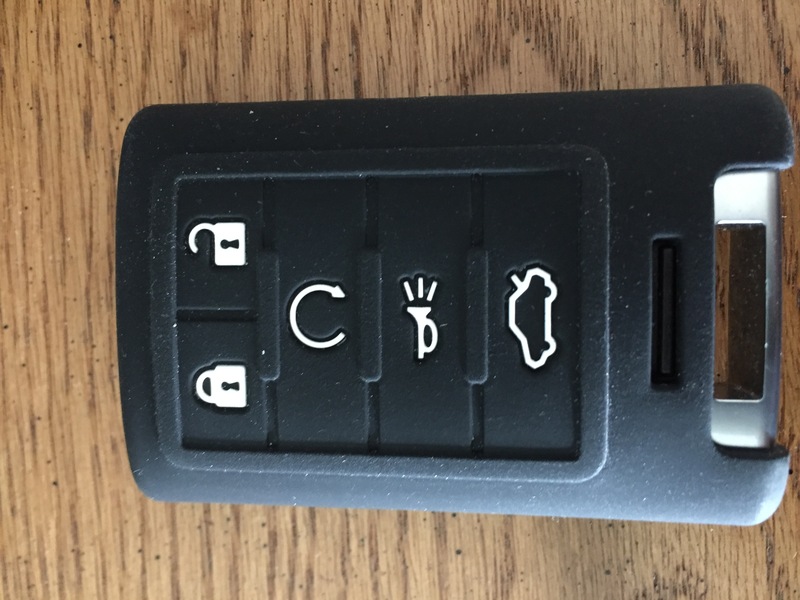 The slot is for when the FOB is not opening the door or the battery is drained. You seem to have some sort of psychological need to "stick your key into the car in order to operate it". That's so last century! Leaving the keys in the car like the secret compartment or door pocket should sound the horn 3 times if you forget it. That's what that 3 horn toots are for. I just leave it in my pocket. Why take it out? There is a slot in the steering column for the fob and plenty of room in the console or behind the nav screen etc. My question is ‘is there a best place to keep the fob’ and why? FOB never leaves my pocket. The only time it does is when I go back into the house and it and my wallet go into a draw. When I walk away to go into a store it locks the doors, don't have to think about it! That slot is IF the FOB battery goes dead. No need to every use it if you replace the FOB battery every ~2 years. Last edited by JerryU; 03-30-2018 at 12:22 PM. I keep fob in pocket. I did buy silicone case for fob which makes it less slippery in pocket. A few times fob fell on to seat when getting out of car. No more of that problem with case. Case was cheap around $ 4.00 on Ebay. So far I have been keeping my C7 key fob in my pocket when I drive my Z51. I have strict rules for where the fob and other important objects (wallet, cell phone, etc.) are stored. The fob is either on my key holder behind the kitchen door, right front pocket of the pants I'm wearing, or the workout bag. No exceptions, which is why these things are never misplaced--except when I break the "no exceptions" rule. I rarely interact with it, and like Jerry U I have it set to automatically lock/unlock the doors when I approach. Last edited by iclick; 03-30-2018 at 12:52 PM. I treat it in the same manner as the old fashion keys... in my pocket. Well Jerry, you beat me to my answer bud. Last edited by Rebel Yell; 03-30-2018 at 04:32 PM. The watch pocket (little pocket in right front pocket) in jeans works great because the fob doesn't scratch other things or vice versa. It's also a tight enough fit that the fob never slips out. Right this minute? Where is my fob? It's on a shelf three feet behind me talking with the Ferrari key. When the fob and I leave the house it's in my pocket where, for me, it should be. Sometimes, when I forget, the fob and the Ferrari key are in left front pocket together. I have no idea what they do in the dark. Last edited by 4thC4at60; 03-30-2018 at 01:23 PM. In my pocket so I don't forget it. Only problem is when my wife is in the car with her fob in her purse, the system usually picks up her fob rather than mine. Then the seat goes forward enough to break my legs if I don't hit the button on the door asap. I tried an aluminum foil cover, but that was insufficient so I bought one of those Faraday bags from Amazon that stops the emissions. https://smile.amazon.com/gp/product/...?ie=UTF8&psc=1 Seems to work fine. I keep mine on a chain around my neck. I find it a pain in the azz in my pocket. Otherwise it is on a key-hook in the hall closet. Sure wish I could get something smaller to wear on my wrist or be able to transfer the electronic signal to open the door to my cellphone. Then I could wear the key on a chain rather than the entire fob. Haha me too. Key will be in front right pocket, if not the cup holder and in gym bag or golf bag. If I'm at home, on top of the dresser near the door. Pinned to my bra strap. When in use, in my left pocket, iPhone in the right, wallet in hip pocket...made it a habit to do a "3 check" before leaving the house. Have used the steering column receptacle only to check how it worked. Quick Reply: Where is your key fob?